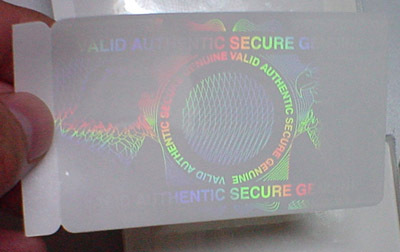 High brightness,perfect transparency!  Extremely Low cost for custom design! 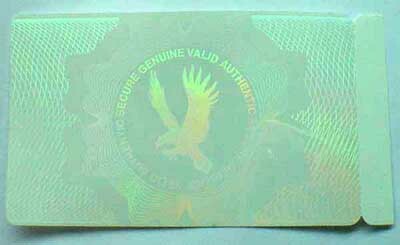 Clear ID Holograms (Hologram Overlays, Holographic ID Overlays, Clear Holograms) made for ID Cards protection against fake ID cards and cheap Identifications. 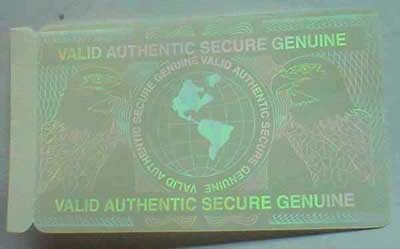 Transparent ID holograms are indeed transparent holograms and do not abstract the image on ID cards and you can see its Hologram image. 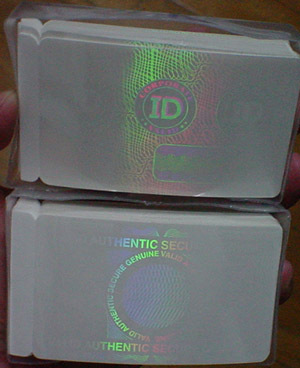 ID Holograms are specially sized for ID Cards (Identification Cards) and are pressure sensitive, self adhesive holograms. 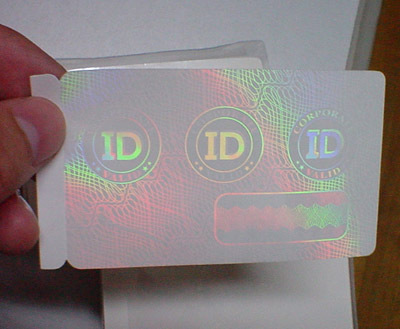 Just remove paper liner to activate adhesive and apply ID Holograms over your ID cards! 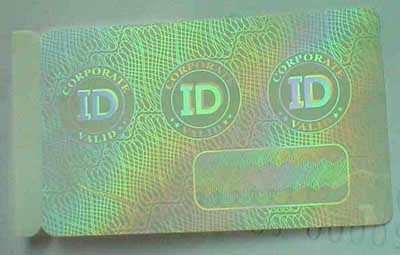 Transparent Hologram ID Card Overlay is transparent, self adhesive labels for use over identification cards, employee badges, and any other cards subject to tampering and/or forgery. 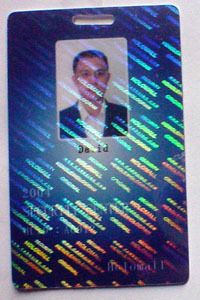 An overlay with a custom origination of your company name/logo offers the most security for your ID cards. 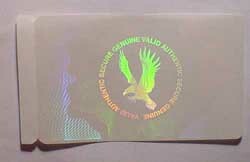 After creating a custom security-grade origination (dot matrix or 2D/3D) for your company/organization, the design is registered with the IHMA global registry. 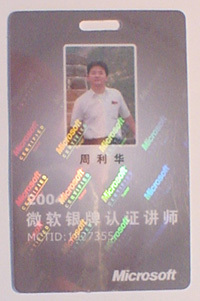 The overlay is constructed in one layer. 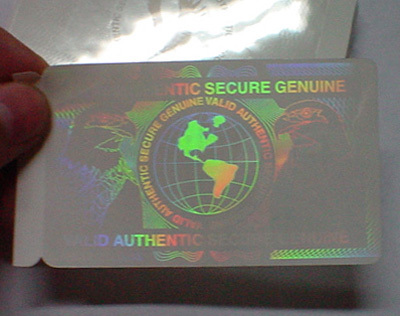 The hologram is embossed on 25 micron, 50 micron and 100 micron thick sepecail polyester film. 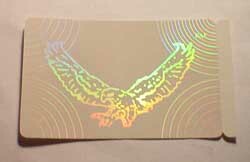 After embossing, a permanent acrylic adhesive is applied over the hologram. The overlay is then die cut to size. Total thickness is 30 micron (20 micron polyester + 10 micron adhesive). This product is available in "peel & stick" labels for easy application.